Alan Ayckbourn might not seem to be an obvious choice for a company like Soulpepper that gained renown through its productions of Schiller, Molière and Chekhov, but it proves to be an inspired one. Director Albert Schultz does not make the mistake of treating Ayckbourn flippantly. His insightful approach draws fine performances from the entire cast and reveals a comedy of surprising richness. Ayckbourn has often been glibly called the British answer to Neil Simon. Simon, however, is far more interested in set-ups, punchlines and one-liners than in realistic dialogue or character delineation and has never been preoccupied as is Ayckbourn with the nature of theatre itself. It's true that Ayckbourn began with writing farce, but for some years now his plays have been exploring the question of how theatre represents reality and how reality is theatrical. "A Chorus of Disapproval" from 1984 is a perfect example. In it we meet a village light opera society as it begins rehearsals for John Gay's "A Beggar's Opera" (1728). Guy Jones, a widower from Leeds, joins the society hoping to meet people and get out more. This he does to an extent far beyond his intentions. He soon becomes involved in several love triangles and the men want inside info from him on whether the company where he works plans to build on an adjoining piece of land. By never saying no to sexual or monetary favours, Guy advances from a one-line part in the "The Beggar's Opera" to the main role of in Gay's opera, Macheath. Ayckbourn has cleverly paralleled the rise of this innocent with the plot of "The Beggar's Opera" itself, which, like the better-known "The Threepenny Opera" based on it, is a mock-heroic take on the London underworld of thieves and whores. Its satire suggests that apart from its claim to morality mainstream society behaves no differently than the lowlife it despises. As Ayckbourn so wittily demonstrates village life can provide its own parallels. In "Chorus" the worlds of the play and "reality" converge as Guy grows into his true role in both and we see the innocent achieve more by acquiescence than the play's director does by control. I'm sure the other attraction "Chorus" holds for Soulpepper is its parallel to Chekhov's "Platonov". In both the arrival a new man in town creates chaos in village life. While Platonov is known and Guy Jones unknown to their respective social circles, the intense focus on the newcomer by both men and women suggests an emptiness to their lives that involvement with the newcomer makes even worse by play's end. Schultz focusses on bringing out this dark undercurrent, treating the play very much as if it were indeed a modern Chekhov. While the show is not as knee-slappingly funny as it might be and while the pace could be more lively, what comes through is a warm sense of humour and a delightful sense of atmosphere. Schultz makes Ayckbourn's portrayals of amateur theatricals so accurate they will bring a broad smile of recognition to anyone who has ever taken part in them. The performances are excellent from top to bottom. Most notable is Ted Dykstra in his first non-musical role in Toronto in quite some time. He is hilarious as the Welsh director Dafydd ap Llewellyn, who soldiers on trying to make amateurs create "art" despite disaster after disaster. Dykstra captures perfectly the humour in someone whose enthusiasm seems so out of synch with the reality around him. His self-absorbed brashness is the perfect foil for David Storch's timidly innocent Guy Jones. Storch is exquisitely funny in as the naïve newcomer who has unexpected entered a local minefield and just as unexpectedly negotiates his way out. The rest of the cast give us a gallery of detailed characters. Susan Coyne's portrayal of Daffydd's neglected wife Hannah is more akin to tragedy than comedy. The emotion she brings to being loved and abandoned by Guy is key to making us question Guy's innocence. In contrast, C. David Johnson and Nicole Underhay are purely comic as the lascivious swinging couple Ian and Fay Hubbard. Underhay is especially good at capturing a particularly British brand of tartiness that make the long scene of double entendre with Guy the funniest in the show. Oliver Dennis and Denise Fergusson are hilarious as the pleasant but totally inept Ted and Enid Washbrook. Fergusson gives Enid the just the right dottiness and Dennis's timing is perfect as a man who misses all his cues. Nancy Palk and Jim Warren are the third couple, Rebecca and Jarvis Huntley-Pike, now separated. Palk's version of Rebecca's cynicism is a bit more generic than it should be, but Warren makes the eccentric, meddler Jarvis distinctive and memorable. A love triangle that cleverly prefigures Guy's situation involves Patricia Fagan (Linda) and Sarah Wilson (Bridget) as rivals for Ryan Field (Crispin, the young man cast as Macheath). Fagan does not have much to do, but Wilson makes the most of Ayckbourn's dig at loud, officious stage managers. Field is a real find as both singer and actor. On stage at the upright piano for most of the show is Marek Norman as Mr. Ames, able just like his character, to play any tune you wish. His turn as the title character in Gay's opera, stricken with a totally unconvincing lameness, is a moment to cherish. Guido Tondino's set is simply a modern version of his set for "The Winter's Tale" (playing in rep with "Chorus"). It basically represents the red brick stage/rehearsal space for Dafydd's company, that under Steven Hawkins inventive lighting can become a variety of interiors. Anyone who wonders what lighting designers can do will get a full display when Dafydd haplessly tries to coordinate lighting cues for his show. Schultz has made the blackouts that end scenes into transitions where characters speak in the dark when they enter a room fumble about for the light switch. Victoria Wallace's costumes both capture the time and place of the action and insightfully reflect the personality of each character. The Soulpepper troupe clearly enjoys this excursion into more recent drama and Schultz knows how to make the most of it. Toronto is rather behind in catching on to Ayckbourn, whose work features regularly at the Royal National Theatre and the West End. Since Schultz and his company have the knack for it, perhaps they'll bring us more from him in the future. Meanwhile, if you are looking for an entertainment as hilarious as it is intelligent, join their "Chorus". 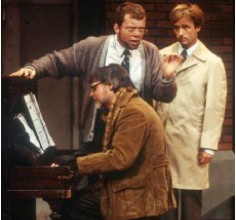 Photo: Ted Dykstra and Savid Storch (standing) with Marek Norman (at piano). ©2002 Cylla von Tiedemann.